Her debut album Sonho, Portuguese for Dream, is just that in places. Dreamlike. There’s the very first tune, “Aquelas Coisas Todas” (“All Those Things”); Brazilian dreams: beaches, beauties, beverages, bistros, bossa nova. Brazil has a myth, a legend, a romantic sense of passion and languor that Tseng acquired in Greenwich Village and honed in the Washington D.C. Brazilian music scene. Don‘t sneer. The legend, the essence, is often sensed most strongly by those who know first only the myth. But Emy Tseng is real. A remarkably clear voice. An adept student working hard at her craft. More than that, a gifted artist starting on a long path. 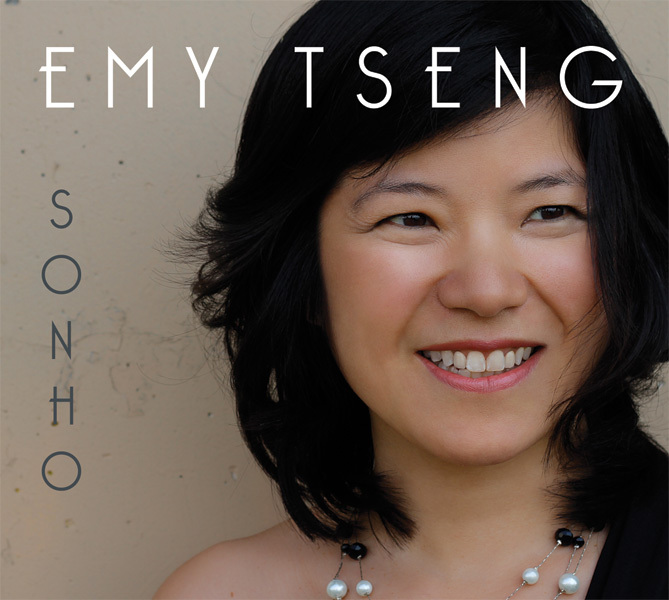 You don’t have to know the language to hear the allure in “Berimbau” with her sultry voice playing off Andy Connell’s soprano sax. (More about this guy later.) And if “Berimbau” flirts, Caetano Veloso’s “Coração Vagabundo” seduces. Again a dream: It’s deep dusk and a few dancers move smoothly on the floor. Andy Connell’s clarinet doesn’t accompany, it sings with her. You see, I don’t know Portuguese. Like a lot of gringo Americans I have a passing acquaintance with English, some street slang, and little else. So I have to respond to the music and her voice as instrument. Except in a few places. “California Dreamin’” is a surprise – yes, the Mamas and Papas song — but it fits because she does it as melancholy and mournful and gives it a greater depth than a cold, broke hippy. Another dream. Matvei Sigalov, an acoustic guitarist, plays wonderfully here and elsewhere on the album. There’s her marvelous closing rendition of the classic jazz standard, “Close Your Eyes,” where she is accompanied only by David Jernigan’s wondrous acoustic bass. What’s created are spaces, silences between the notes of the two that would please even those discerning guys at ECM. Did I close my eyes? Yeah, for a moment, to hear those most comforting words “I’ll be here by your side” in pure tones. Delicious. On another standard that has become a jazz classic, “I Thought About You,” I thought about Emy doing a big piece of the Great American Songbook on a future album. Johnny Mercer songs, Cole Porter songs, Gershwin maybe. It wouldn’t be better than her Brazilian jazz but, I think it might be very good indeed. Still, she needn’t stray far from Brazil. “Na Beira do Rio” shows how that distinctive Brazilian style of rhythm and melody can heighten emotional content with a singer who feels it. Sigalov again helps entrance us. But the guy who really knocks me out on the album is the previously mentioned Andy Connell, who puts in two distinctive performances on clarinet and two more on soprano sax. The clarinet is such a terrific instrument to listen to, but it’s often pushed aside, it seems, by our obsession with brass. I have it too. It’s, well, it’s brassy, commanding attention. But the clarinet floats on high and rides the wind when played by a guy this good. Similarly, the soprano sax seems often neglected for its larger siblings but is equally evocative. Tseng, in the best jazz tradition, lets Connell and the others be showcased strongly, often as equals on songs. If you’re like me, you tend to like your music “from the street” and to be a little suspicious about too much of an academic music background for rock or jazz. Hell, Tseng’s academic credentials even include a degree in Math. Yet the mistrust of learning and over-reliance on “street cred” can be distinctly anti-intellectual. A formal quality education in music also has the potential to expand creativity, not diminish it. Emy Tseng will prove that, I think. To read more posts, columns and reviews by Brian Arsenault click HERE.